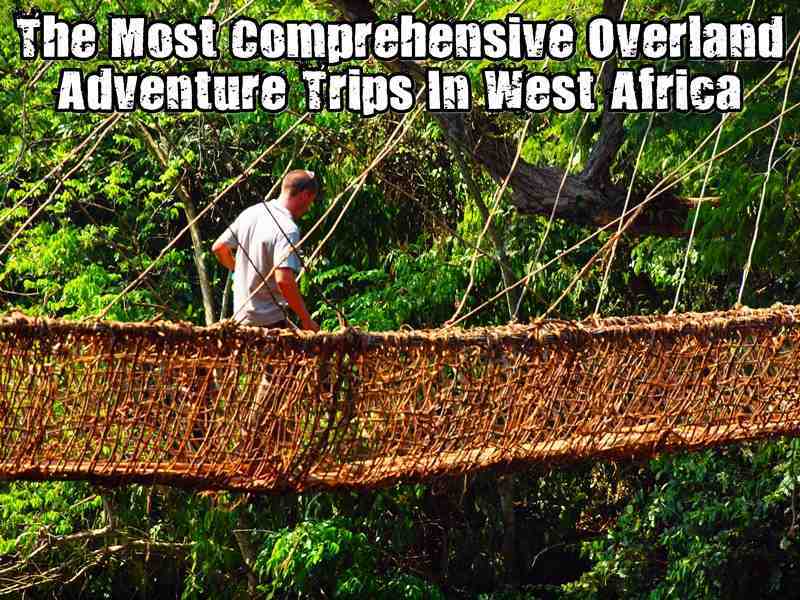 At Overlanding West Africa we love to highlight the beauty of the countries and people that make up this lesser known part of the African continent. We’re happy to say that our hard work and efforts are paying off in terms of raising the profile of our company and West Africa as an adventure travel destination! In November 2015, Sierra Leone was ‘officially’ declared free of the Ebola virus after many months of suffering. Our Dakar to Freetown group arrived at Bureh beach for the night as the BBC were filming, and they interviewed Al and some of our group for their latest story about how tourism has suffered in the country. We’re truly proud to be one of the very few operators to return to sweet Salone so soon! 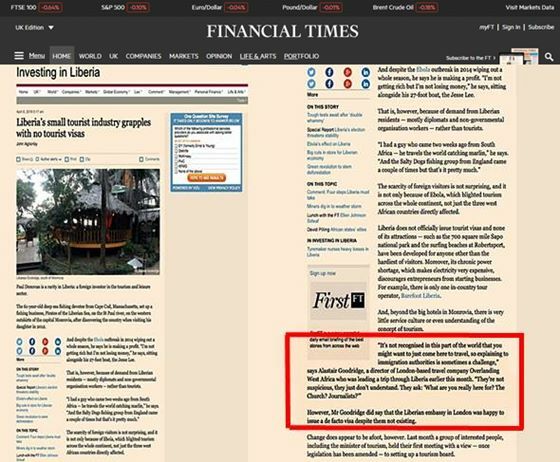 East Africa correspondent for The Financial Times John Aglionby, found himself on the other side of the continent in April 2016 to report on how Liberia is rebuilding after the Ebola outbreak. 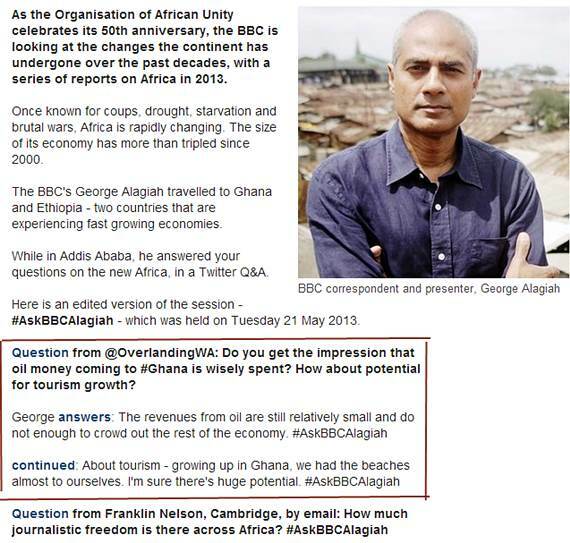 He saw Al and our Accra to Freetown group in Monrovia and included Overlanding West Africa in his article. To the best of our knowledge we’re still the only truck-based overland operator to ever run trips in Liberia, and we’re proud to be playing a very small role in helping promote a more positive image of this beautiful country! 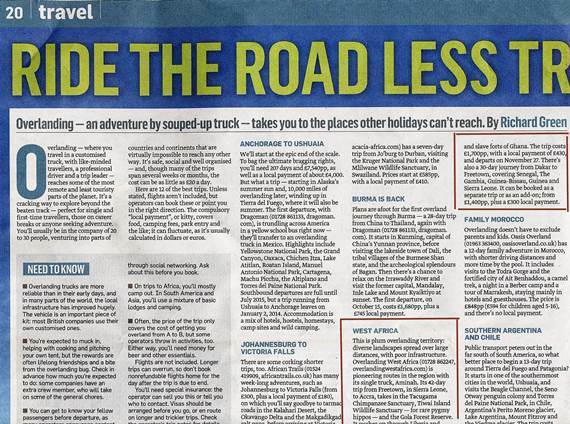 We owe a huge thank you to Nick Redmayne from The Independent newspaper here in the UK for mentioning Overlanding West Africa in his article entitled Travel Destinations That Need Your Presence In 2016. 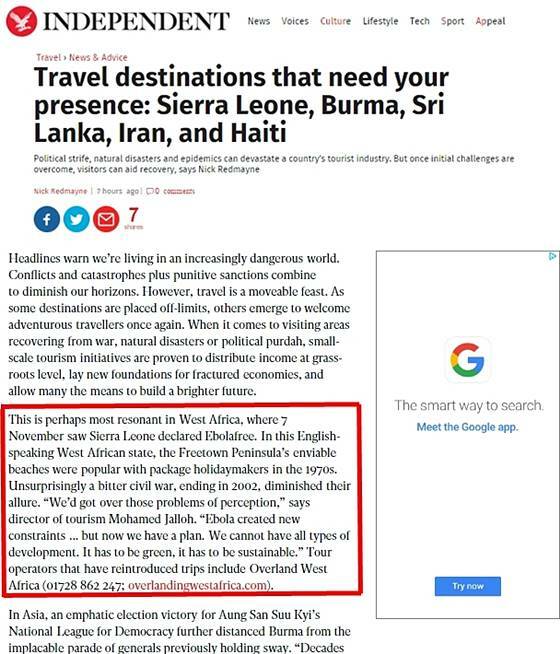 Nick mentioned Sierra Leone as one of those destinations, and was kind enough to include us as one of the very few operators to return to the country so soon after the Ebola outbreak, something we are very proud of indeed – thanks Nick! 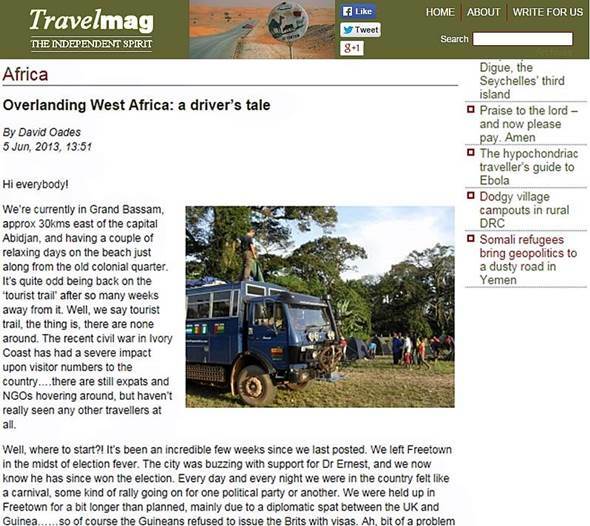 Richard Green at The Sunday Times, a fellow West Africa aficionado, was kind enough to include Overlanding West Africa in his “Ride The Road Less Travelled” article in January 2013. Featuring our new exploratory trip through Liberia in the article we truly believe a place for this trip is warranted. To date, no overland truck based company has been through Liberia – we will be the first! Along with being the first to run trips through Guinea Bissau and Sierra Leone in 2012 we are very proud to be pushing this little known corner of Africa to the adventure travel market. 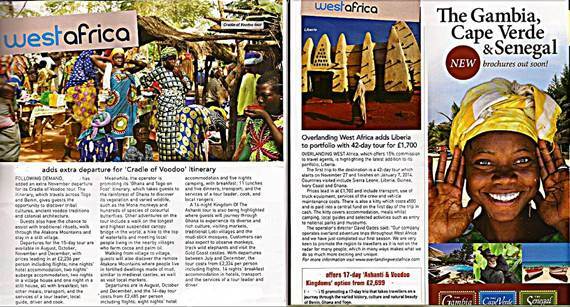 Tom Yarwood, Editor of The Week magazine in the UK, wrote an article about travel in West Africa entitled ‘West Side Story’. 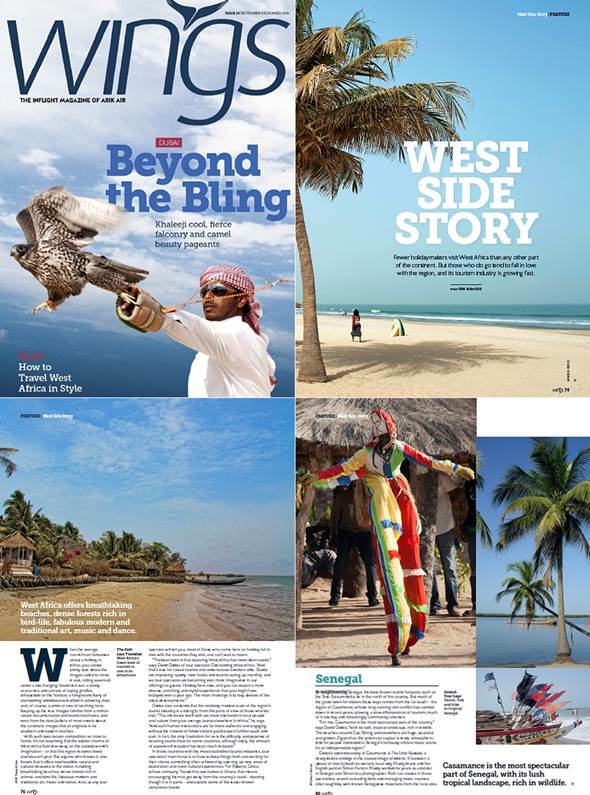 Tom’s article appeared in the September 2014 edition of Arik Wings magazine, listing some of the best places to visit and stay in the region alongside some fantastic photos. 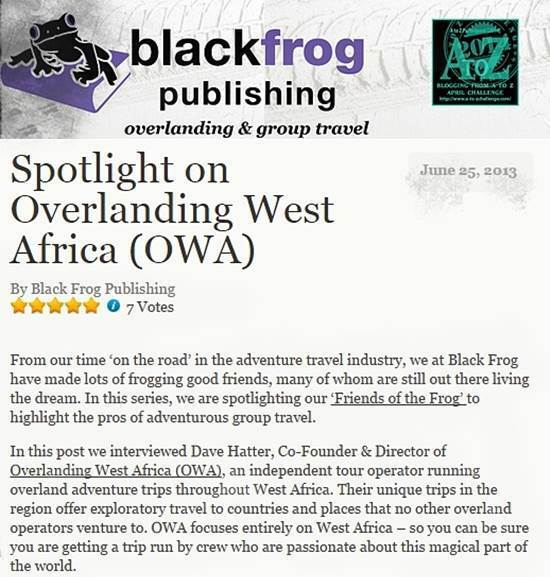 We’re very grateful to Tom for including Overlanding West Africa in the “Top Tips And Trips” write up in the feature! You can read the article in full by clicking on the image below. 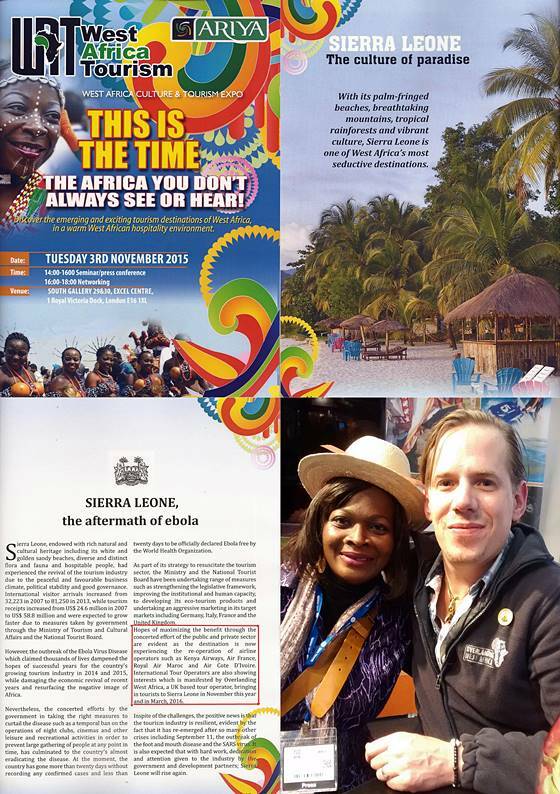 We are very grateful to Ola and the entire team at Come To West Africa magazine for including OWA on the front cover of their latest edition, and for writing an 8 page article about us! Entitled “Unforgettable Road Trips You Will Want To Be Part Of” it highlights what OWA is about as a company, what we are trying to achieve with our trips, and mentions some of the great places we visit with a great selection of photos. 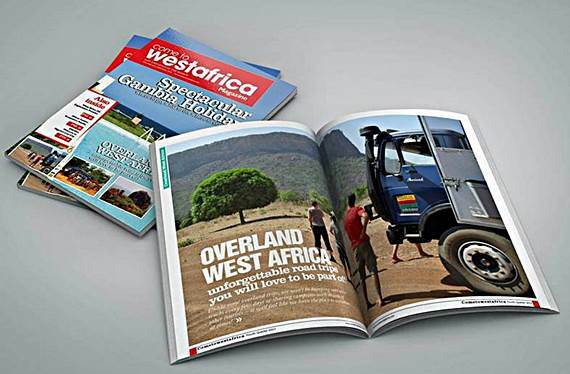 Since October 2014 Overlanding West Africa have been heavily involved in setting up and promoting the Unite4WestAfrica initiative along with West Africa Discovery and Another World Adventures. As a result we were featured in the April 2015 edition of Arik Wings Magazine and an article about rebuilding tourism in West Africa. Two of our trips made the cut for their ‘Top 10 West African Trips for 2015′ – many thanks to Larissa Clark and Arik Wings for including us! We had a great piece written about us in the May 2013 edition of Travel Bulletin magazine (thanks to Jill for including us!) Focussing upon new destinations for the coming year in West Africa, our Freetown to Accra trip made the cut as it will be the first overland truck based trip to ever go through Liberia. Exciting times ahead! A big thank you to Ashley Mackenzie who included Overlanding West Africa in an article about how Sierra Leone is starting to attract visitors back to the country since peace returned over ten year ago. 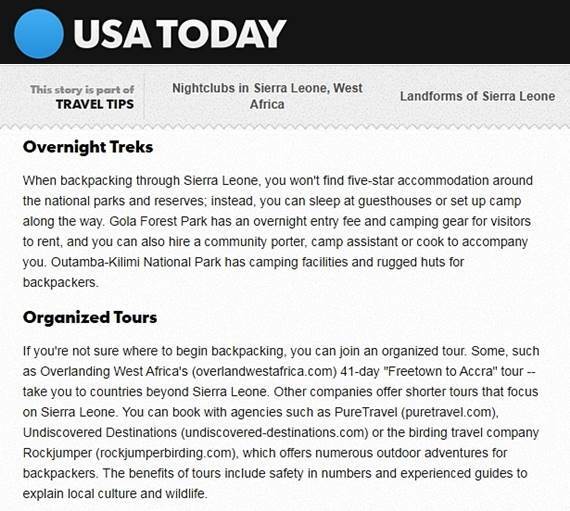 Ashley’s article in USA Today focuses upon the massive progress the country has made and talks favourably about tourism development for Sierra Leone in the future. Thanks for the mention Ashley! 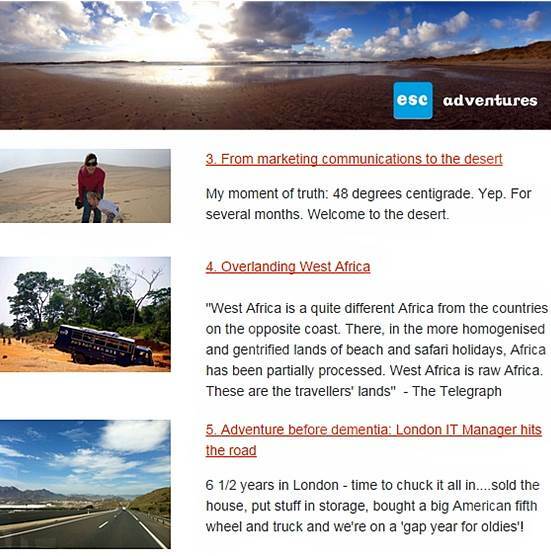 We are also grateful to Christophe Noel who wrote a great piece about us on Expedition Portal this is a website dedicated to some of the most exciting overland expeditions out there, with the tone of Christophe’s article complimenting OWA for going where we go and the spirit of our trips. Thanks Christophe! OWA were included in Escape The City’s recent Top 10 Escapes article. E.T.C have a great website, designed to tempt people away from the hustle and bustle of a career in the city and show them there are alternatives to city life. 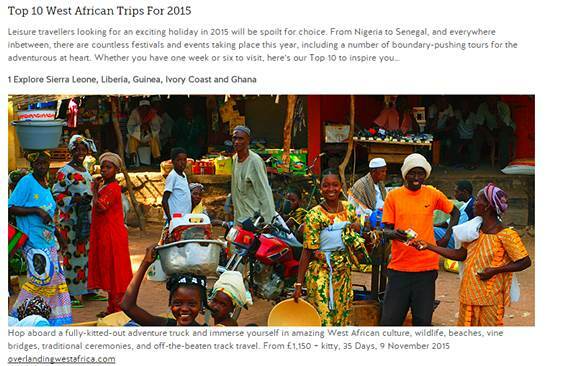 Thanks to Ben Keene from Tribewanted in Sierra Leone for recommending us for the list! We’ve also featured in Black Frog Publishing’s recent ‘Spotlight’ series of interviews. Kirsty and Andy have many years of experience working in theoverland industry and have now set up a publishing company focussing upon adventure travel. They interviewed us for their latest article highlighting why we set up Overlanding West Africa and what makes the region so special to travel in. Thanks guys! One of our travel blogs was published in Travel Magazine in May 2013. You can read about our first ever exploratory trip via the link below as we journeyed between Sierra Leone, Guinea, and Ivory Coast. An incredible journey with some superb photos attached! 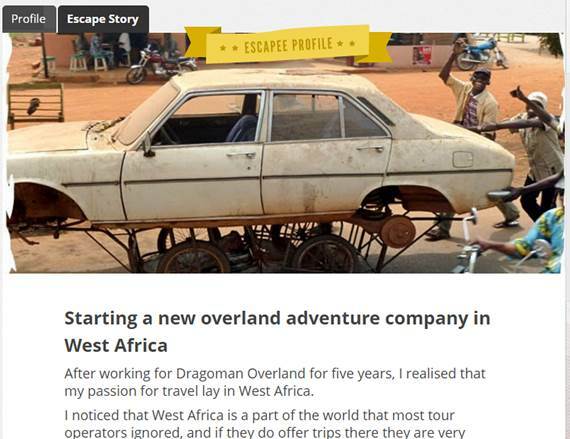 Dave The Hat was interviewed by Escape The City in 2011 about why he set up Overlanding West Africa and what was involved. You can read the interview by clicking on the photo below. Escape the City is run by Dom Jackman, Rob Symington, and Michael Howe, aimed at highlighting there is more to life and alternative careers that don’t involve climbing the corporate ladder! 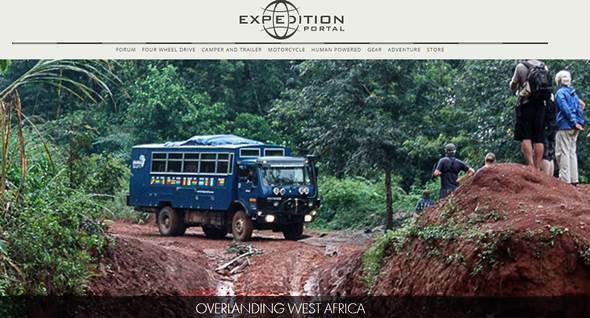 Overall we are very pleased that we are cementing our reputation for operating the most indepth and comprehensive overland adventure trips in West Africa, going to more countries and visiting more places than any other operator. Please read the Passenger Feedback from passengers who have travelled with us before, and see what makes our trips better than any others out there by reading our Why Travel With OWA? page.